In this VETgirl 2-hour, online veterinary CE webinar sponsored by VenomVet, Dr. Raegan Wells, DVM, DACVECC, reviewed envenomation secondary to Crotalinae snakes (e.g., pit vipers). 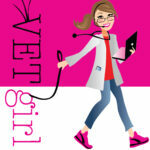 As both local and systemic venom-induced toxicity can occur, this VETgirl webinar discussed how pit viper venom results in toxicosis in dogs and cats. This lecture also reviewed the clinical signs and organs affected by rattlesnake envenomation, and reviewed overall treatment (including fluid therapy, antibiotic therapy, plasma transfusions, and antivenin use). Finally, we reviewed the different types of antivenin available on the human and veterinary market at this time. I hope this is registering for the webnar? To register for the webinar it is required to be at least a trial member for this sponsored webinar and to use the GoToWebinar registration link. Hi Lori – you may need to clear your cache or cookies to LOG in. Make sure you are logged in and it will take you to the right page. If that doesn’t work, please email us at the contact page ok? The link from the e-mail leads to this page, but I can not see a link to register on this page. Is there any other way to register? The webinar was already given, 2 days ago – therefore you can no longer register for it. Hello, I am watching the recorded webinar right now and I wanted to let you know that there is a big lag between the speaker and the slides (slides are ahead of the speaker). It is the first time I see this, keep the good work! Thanks for letting us know – it’s based on your wifi/Internet speed, so it might be best to let it buffer and close out of anything that is internet-heavy (e.g., Dropbox, etc. ).